This is subtle, shimmering music. No clumsy welding of styles here. Rather a precise, nigh-surgical splicing of two cultures together through their indigenous musics. Navá have crafted a record in ‘Tapestry’ rich in colours and textures. 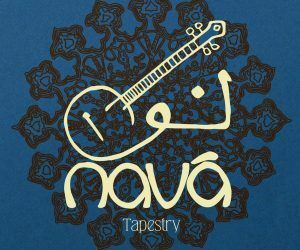 Navá combine traditional Irish music with Persian music to create a sound that is thrillingly unique but that seems so natural that it surely must have always been here. Where many players of traditional music want to keep their style as close to the way it has been for centuries as possible, Navá are unafraid of experimentation. And they possess between the four of them the virtuosic skill levels required to make their experiment a success. Opening track The Rolling Wave/Chahar Mezrab rolls out of the speakers like waves breaking gently on the shore. And Comb Your Hair And Curl It carries one high on its grooving shoulders. Where less capable musicians would have settled for sticking the Eastern elements into their Irish sound like pins in a voodoo doll, Navá blend the genres seamlessly. Giving equal footing to both cultures. In a world that grows increasingly xenophobic, it’s a message of cooperation that speaks across oceans and continents. ‘Seven Swans’ moves with all the grace of its titular birds. The acoustic guitar providing a beautiful, deep accompaniment alongside the hand drums. A solid foundation for the shimmering string instruments that skate over the top. ‘Banish Misfortune’ has the majesty of a great ship bound for far-off lands. It’s exotic, yet familiar. All the components have been seen before in various guises, but never together like this. So what seems familiar apart comes together as a fresh, exciting whole. ‘Without deviation from the norm, progress is not possible,’ as Frank Zappa put it with his trademark eloquence. ‘Tapestry’ is an album that sounds like progress. There is nothing stale or re-hashed about it. Traditional music by its definition is old. Navá though, haven’t so much put a modern twist on age-old genres as put two of those old genres together and come up with something modern. They have come up with a step towards the future. ‘Tapestry’ is a record of care and craftsmanship. There’s nothing cynical in it, nor malicious. The four gentlemen that make up Navá simply wanted to explore the outer reaches of their musical fields. And they have brought back the sounds of these lands and weaved them into a tapestry for generations to marvel at. Like what you hear? Check out our Plec Picks 2018 feature on Nava.